Join Dwell and Marimekko tonight in their Beverly Hills showroom for a lively discussion about the Finnish company's history and best-selling hits. In preparation for the evening's presentation, we share a few of the most iconic textiles from the over-sixty-year-old textile manufacturer. For more information and to RSVP, click here. Easily one of the most readily identifiable patterns, Unikko was introduced in 1964 by designer Maija Isola. She actually created the print in protest against the company's founder, Armi Ratia, who said that floral patterns had no place at Marimekko. With her bright, graphic textile, Isola conceived a company standard that has been in continuous production since 1964. Today the pattern has appeared on everything from TV boxes to Nordic walking poles. Created in 1966 by designer Annika Rimala, Iso Suomu is a versatile pattern that is a mainstay in today's fashions from Marimekko. Rimala's sartorial creations regularly appeared on the covers of international fashion magazines in the 1960s, including Harper's Bazaar, Vogue, and Elle. Rimala worked for Marimekko from 1960-1982 and her work continues to inspire contemporary fashion designers. Introduced in 1968, also by Annika Rimala, Tasaraita heralded Marimekko's first cotton jersey collection. It was an immediate success, and soon appeared on everything from T-shirts and nightgowns to underwear and rompers. Today the iconic stripes appear throughout the company's inventory, cloaking mugs, bags, and bed linens. Conceived by the great Maija Isola in 1964, Kaivo is indicative of Isola's work as a painter. "I tend to see everything in patterns…when I go see a film, look at snow and ice, wash dishes or maybe the most when I am in love," said Isola in an interview in 1966. 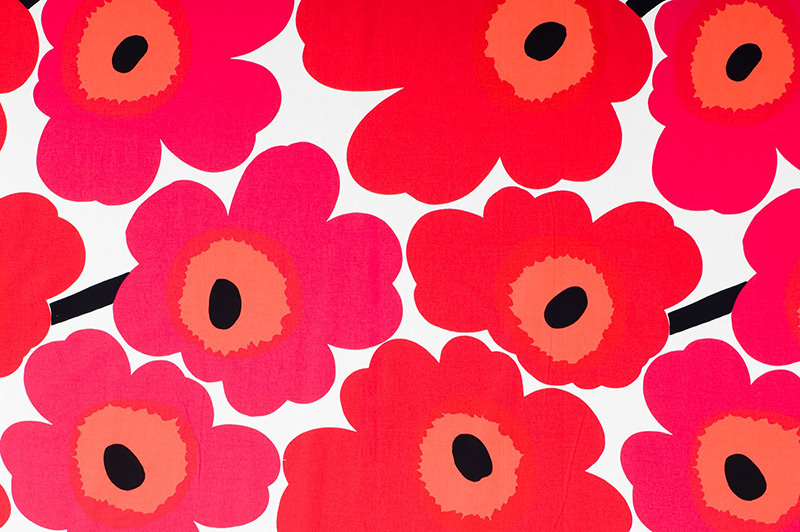 Over the course of her career at Marimekko, Isola created more than 500 different patterns. She remains one of the most famous contemporary Finnish textile designers. This delicate pattern was designed by Kristina Isola, daughter of Maija Isola, in 2008. Kristina learned the craft at her mother's knee, watching as Maija sketched textile patterns. "My mother taught me to be methodical and to plan my work beforehand," recalls Kristina. "I also learned that you don't have to see work as a necessary evil. It can be enjoyable." Today Kristina works her own daughter, Emma, continuing the Isola family legacy within Marimekko. The pair have recently created new colorways for Maija Isola's Mehilaispesa (which means "bee hive" in Finnish) pattern from 1961. "I designed this pattern when my daughter was building her own home and I spent a lot time with my granddaughters," says Kristina Isola of the pattern she created in 2007. "We would wander off to a nearby forest clearing. There we would sit down, eat our lunch, and drink warm berry juice. I looked on as my granddaughters pretended some fallen trees were crocodiles lurking by the river bank…I feel happy in a forest, as if I were visiting a dear friend." Created in 2010 by designer Maija Louekari, Lappuliisa is but one of Louekari's many designs. In her other patterns, she often expresses a focus on urban and rural landscapes. "When I began an Marimekko, I knew very little about textile printing. I've learned a lot from the people at Marimekko's artwork studio over the years—especially what you can and can't do with textile print design," she says. It was when she was learning to use the technique of overlapping colors to create new shades that she developed Lappuliisa. "The design came to me after seeing old pot holders at flea markets," she recalls. "Traditional potholders can be incredibly colorful as people used leftover yarn to knit or crochet them."